coming soon to your letter box!!! 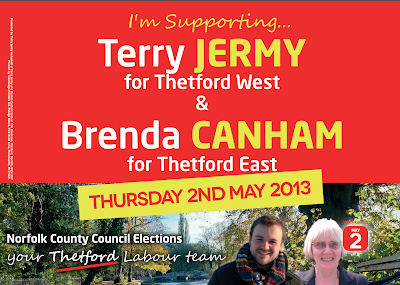 this is the back page of the first election leaflet for myself and Brenda Canham in the run up to the Norfolk County Council elections on 2nd May 2013 - it doubles up as a poster so feel free to display it in your window!! As well as showing your support for us it also discourages others from putting their literature through your door! Thanks to Jon W. Chambers for the excellent design work. On the front of the leaflet you will find our five priorities for Thetford, please do let us know what you think and share with us any thoughts that you may have on your priorities.